Personal Food Support Coaching Tailored For You & Your Lifestyle! You have been requesting and I have been listening! Now I present to you a personal food coaching service designed to teach, excite and inspire you through consumption of nutritious food and a healthy lifestyle. Are we truly what we eat? Absolutely positive! If you are looking for ways to improve your mood, strength, energy levels and your overall health, taking control of what you eat is the very first step. Sounds easy, right? Well, just how much do you know the ingredients necessary to achieve your unique health needs? If you have the ingredients, do you know how to prepare a healthy meal that addresses your specific health goals, problems or challenges? And even if you know how to prepare, how do you train yourself to develop a healthy eating habit and lifestyle? This, and many more are the issues or challenges related with establishing and maintaining a regular consumption of nutritious food and living a healthy lifestyle. Good News Is, With Time, Dedication and Right Support, Anyone Can Achieve A Healthy & Nutritious Lifestyle! Based on both personal experience (including insights I’ve acquired working with various clients) and my culinary background, I have developed a highly effective program that delivers a wealth of practical knowledge about food and health to all clients. I’ll give you an introduction to better health and lifestyle, walk you through the entire process and ensure the achievement of your health goals! I am helping families to build up new healthy eating habits in their every day life. I know how difficult it is to satisfy each member of the family with food, especially when you want to bring a healthy menu on the table. Whether you want to eat more whole plant-based foods or you are forced to change your eating habits because of diet restriction due to gluten sensitivity, sugar or dairy intolerance I am here to help you to make that transition with long lasting positive results. I am helping individuals to transition into special diets: gluten-sensitivity, dairy intolerance, sugar sensitivity and love it. I am helping people to transition into a sustainable, healthy and consciously lived vegan lifestyle. I listen carefully to your needs, problems and challenges. Based on that I customize the food program in 100% to your needs and help you to apply it step by step until it is fully understood by you and easy to implement. Plant based food are nutrient dense and support the whole body, helping you maintain a healthy weight, prevent disease and even reverse disease. Learn how to expand your vegetable repertoire. Eating a whole foods diet does not have to be complicated. Learning how to plan, shop, prep and cook whole food meals means you can put real food on the table every night of the week, in 30 minutes or less. Setting and achieving your goals is the most effective way to keep your health and life in forward motion. Learn how to make goal setting part of your wellness routine. Everybody metabolizes food differently. Eliminating gluten, dairy or other foods that are making you sick will allow your body the much needed time to heal and repair. The first step to a health diet is a kitchen detox! Find out what needs to go and how to re-stock your pantry with the nutrient dense foods that support your new whole foods diet. Most of us are unaware of our destructive behaviors. Gaining clarity around bad habits will open up space to create new, empowering habits that support your health and wellness for life. Expected results without your own work. Health benefits: Normalized bloodpressure. Optimized weight, increased energy level, cured allergies, gastrointestinal problems and nutritional deficiencies. Physical improvements: Loss of extra kilograms in case of overweight. Cleared skin. Mental improvements: Clarity on decision making. Increased productivity at work. Better relationships with coworkers, friends and family. Feeling rejuvenated, calm and relaxed. Lifestyle changes: Implementing healthy eating habits into every day life after the program finished. Food is great avenue to start your journey of self-awareness as well as self-discovery. And if you can view it as a vital source of energy required for you to function at an optimum level, not only are you going to gain really awesome insight into yourself, but you’d also be able to give your best to others around you! My food coaching services strictly follow the plant-based nutritional therapy principles and are supported by the latest research. As a vegan cook with vast experience when it comes to testing of several meal plans ideal for the improvement of overall well being, I know just what’s perfect to help you achieve your health goals! We start with a free consultation to get to know each other. If coaching is right for you, we take an in-depth assessment of your health concerns and goals. Based on that assessment, I will come up with a plan for you. Then we get to work! Group of 4 people: 2500 HUF/person/ hour. Session required: 3 hours. My food coaching service is a partnership between the both of us. My role is to deliver an expert coaching and first class information through support, guidance and resources aimed at helping you form habits which will be a powerful tool to achieve your health goals and have a healthy lifestyle. So why hesitate? Contact me today and have your health needs, worries and challenges completely obliterated! 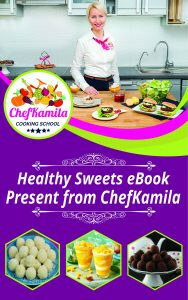 Healthy Sweets eBook with video support! Tasty and quick to make!